The spiritual luminary and a renowned prophetess in Nigeria, Prophetess Faith Aigbe has delivered an average aged man from paralysis, as she exploits the fresh anointing for her forthcoming Ghana, Sogakope Invasion. 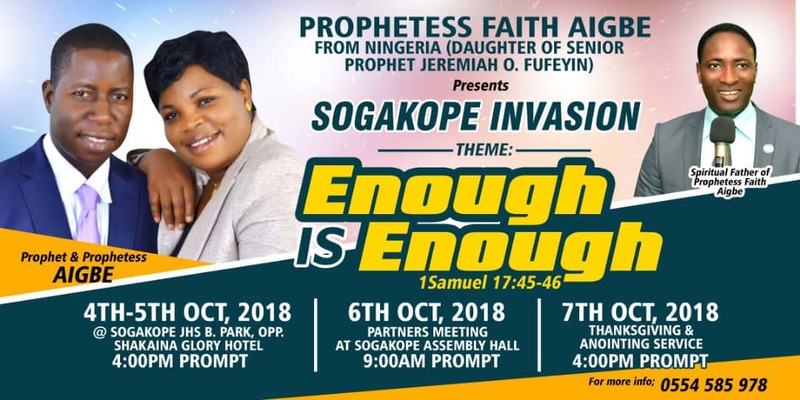 The invasion ceremony in Sogakope will begin on the 4th of October through 7th, with its timely theme, "Enough is Enough". According to the organisers, the program will be held in different locations and for several spiritual objectives. 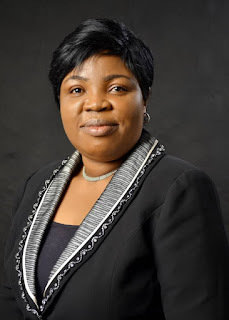 The anointed daughter of Prophet Jeremiah Fufeyin is a highly spiritual being who is committed to kingdom advancement in Nigeria and across boards. Prophetess Faith Aigbe is popular for the countless number of life-changing testimonies she has put in mouths of her believers, beneficiaries of her grace and especially members of Christ Restoration Bible Church, Dawaki, Abuja. 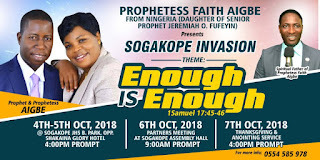 Some Ghanaian believers have reacted to the Sogakope "Enough is Enough" convention, which has been long expected, as Prophetess Faith remains one of the most dreaded spiritual authorities in Nigeria, known for a powerful display of divine anointing, through miracles ranging from paralysis, diabetes, foundational curses, spiritual attacks, stroke, and a lot more. The program according to Prophetess Faith, will deliver fresh anointing for supernatural breakthrough to Ghanaians and also skyrocket the nation into fruitful dimensions. Speaking with our reporter, the prophetess also captured the medium to invite Ghanaians and neighbouring countries to be part of the impartation program, stressing that it is a full pack of glorious interventions to our subsisting challenges.